The Inaugural Cricket School of Excellence is now open for Registration! Phoenix Cricket Club has launched a significant initiative targeted at cricket loving boys and girls between the ages of 11 and 14. 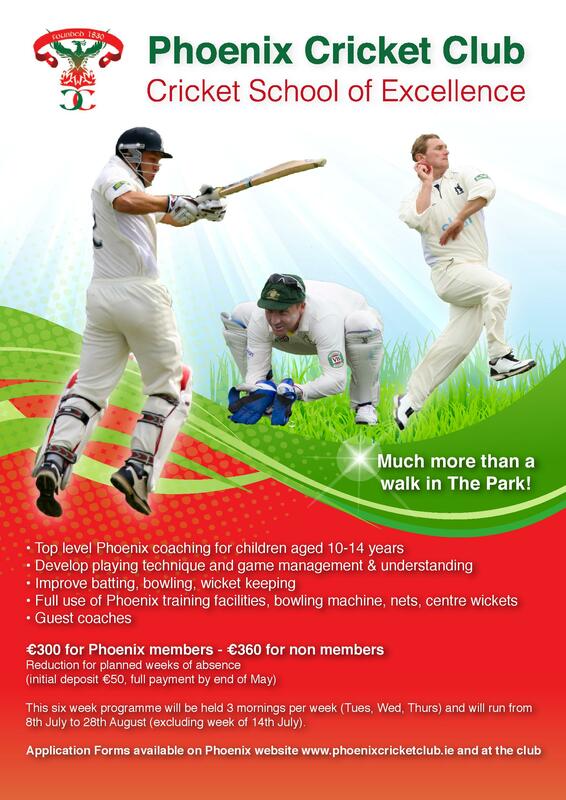 It is open to all interested children with a discount for Phoenix members. A programme of structured coaching for technique as well as game management is prepared for children to get significant time with bat and ball this summer. The cost of the programme is €360 for 6 weeks during the summer holidays, starting Tuesday July 8th. There is a 20% discount for current Phoenix members. Please download the application form and return it to the Club with a €50 deposit to secure your place.